In contrast to Luke Kibet's surprise victory in the men's race, Catherine Ndereba proved yet again that she is the woman to beat in championship races writes David Powell. Second to Paula Radcliffe in Helsinki two years ago and second to Japan's Mizuko Noguchi in the Athens Olympics, Ndereba regained the top spot that she had previously won in Paris in 2003. A former World record holder, Ndereba has now placed in the top two of the last four global championships. She won once before in Osaka, competing in the women's race held over the same course in January 2006. "The Osaka Marathon in the summer and winter are two different things because in winter, in January, I ran the whole race with my gloves on and with something underneath my singlet," Ndereba said. "But, today, if I had been able to run naked I would have," she added smiling. "Unfortunately, I could not because I knew that my daughter was watching and she would not like it if mum was running without clothes on." Daughter Jane, aged 10, saw mum overcome an anxious moment at 35km, when she missed her water bottle, to become the oldest winner of the title at 35. Ndereba's bottle was knocked over by a fellow competitor but she remained cool — in mind of not in body. Rather than being panicked into keeping her place in the lead group, Ndereba went back for her drink. "This marathon was one of the hardest in my running career because of the weather" she said. "At 39km I was amazed that there were more than three runners [in the lead group] and I could not think I was going to win the gold medal. After 40 kilometres I felt I had something left. 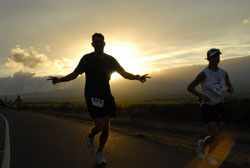 I tried to push and I was able to maintain the pace up to the finish line." It was the slowest of any of her marathons and nearly 12 minutes outside her best time of 2:18:47, but it extends her success to a level unmatched by anyone else. Twice Kenya's sportswoman of the year, and with 17 podium finishes out of 18 marathon starts (the exception being in the 1999 Boston Marathon, her debut at the distance), the deeply spiritual Ndereba is the most dominant figure in women's marathon running. Ndereba led home a Kenyan "dream team" of Boston Marathon winner Rita Jeptoo and three-time World Cross Country Champion Edith Masai ahead of Chinese and Japanese teams more accustomed to the specific conditions faced in Osaka. The 22nd edition attracted 5600 runners from 51 countries, and more than 400 pairs participated in the two-person relay event (with stages of 8km and 13km) - which is a curiosity unique to the Budapest Half marathon. Lack of invitations to foreign elite runners allowed Hungarians to claim wins with relatively modest times that do not reflect the fast nature of the course. Apart from over the Danube bridges the city centre course is completely flat, and many mass runners set personal bests despite the 23°C heat. Passing along the grand thoroughfare of Andrassy Street and just below the Buda Castle World Heritage Site, the course allowed more than 1000 foreign runners to enjoy the sights of the capital at its best. The oldest runner, 80, finished in 2:04. Around 750 runners took part in the 10th edition of this multi-lap race in the centre of the Siberian capital. Sammy Kipkoech Tum broke the old course record by almost a minute. Second-placed Yevgeniy Ribatov, with his brother just 10 seconds behind him, was also well inside the old mark — which had belonged to him. Rashida Hairutdinova clinched the women's race by besting marathon veteran Irina Timofeyeva. The race had been rescheduled from its traditional date on the last weekend in August to avoid conflict with World Championships in Osaka writes Ken Nakamura. Despite the later date, the weather was still far from ideal with 27°C and 50% humidity at the start. The winning times were accordingly slow with Julius Gitahi, a marathon debutant, recording 2:17:26, and Yuri Kano, in her second marathon, running 2:30:43. The men started slowly, passing 1km in 3:12 and 5km in 16:16. Just before 15km Yasukazu Miyasato and Tadashi Shitamori moved ahead. Soon Miyazato fell back again and Shitamori was alone in front. Shitamori led by 24 seconds at 20km and 64 seconds at 25km. He then slowed, but the gap had narrowed only slightly by 30km when Gitahi and Ombeche Mokamba made their move. They caught Shitamori just before 35km and soon after Gitahi shook off Mokamba, and ran alone for a comfortable win. Masaru Takamizawa passed Mokamba in the final metres to take second place. Yuri Kano ran aggressively from the start, passing 5km in 17:17 and 10km in 34:04. The chase pack, which included Harumi Hiroyama and Masayo Kobayashi, was 13 seconds behind Kano at 5km and 18 seconds at 10km. Slowly but surely she continued to increase her lead, from 21 seconds at 15km, to 33 seconds at 20km. Although Kobayashi was trailing behind Hiroyama during the early part of the race, by 23km she had caught her and started to break away. But Kobayashi was unable to get any closer to Kano, whose lead at 35km had grown to 57 seconds. Kano finished exhausted, but her coach Manabu Kawagoe said: "Because she is trying to make the Olympic marathon team, it is good for her to experience a summer marathon." 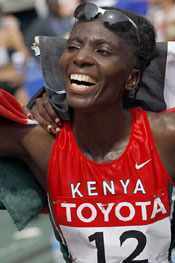 Kano made her marathon debut in the 2007 Osaka Ladies Marathon in January, finishing third with 2:24:43, and was an alternate for the World Championships. The race incorporated the Polish Half Marathon Championships. In occasionally rainy and windy weather 1092 runners finished, coming from 13 countries. Conditions were nearly perfect and the women's race was of a particularly high standard. Jane Muria set a new race record and there were some strong domestic performances. In the men's event Tewodros Shiferaw just failed to beat last year's winning time. The race was a trial for the World Road Running Championships to be held in Udine (ITA) on 14 October. First British runner home, Phil Wicks, ran his debut half marathon and professed himeself pleased despite just missing the World Championships qualifying time. The men's field held together until the final two kilometres, whereas the women's winner led throughout in this eighth edition of the race. 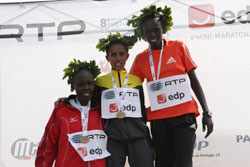 Bizunesh Bekele showed great strength in taking an immediate lead, followed by Tigist Tufa, as she climbed the span of the Vasco da Gama Bridge. Tufa fell back and the chasing group, at first led by Magdalene Chemjor, never got her within their sights. Salina Kosgei chased hard over the final kilometres but the gap was always widening. Chemjor fell back, perhaps under the heavy training load as she builds towards a marathon debut in Amsterdam. 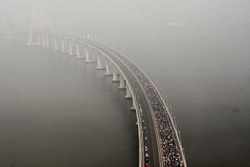 Eight men were detached in the first five kilometres, passed in 14:49. The second 5km split was 14:20, on the outward section of an out and back stretch on featureless highways. Olympic Marathon Champion Stefano Baldini led the chase but the gap continued to grow. Only two runners fell out of the lead pack until they reached 19km, when Robert Cheruiyot made a strong move and took only Jaouad Gharib with him. Cheruiyot edged ahead over the next kilometre or more, but Emmanuel Mutai was saving himself for later. Over the final kilometre he first took Gharib and then passed Cheruiyot for a dramatic win. Marathon debutant, Point Chaza, (25) won a close race from among the field of 400 who contested the race, including a contingent of 10 Japanese runners, under the Japan International Cooperation Agency currently in Zimbabwe on a stint as coaching assistants in higher education institutions around the country. There was also a half marathon, a 10km race for the physically challenged, a 5km run for primary school children and a 500m fun run for pre-schoolers. "This race is certainly challenging because of the hilly terrain which forms the Christmas pass," said Aeneas Nhoro of the National Athletics Association. "It allows us to scout for the best sporting talent. Athletes successful in this event are able to compete better at global showcases." Chaza had previously only run half marathons and 10km races. "My ultimate aim is to represent Zimbabwe at the Olympics", he said. Prize money of US$1000 and $500 went to the top two men and women, as well as to athletes in other categories. Vice Chancellor of Africa University, Professor Rukudzo Murapa offered his profound thanks to the Mutare community and corporate sponsors for continuously supporting the marathon. "It is through your efforts that we are able to host this event annually." The idea to host the Africa University International peace marathon was mooted in 2001, as an international event to promote the concept of peace through sportsmanship, and the first event was held in 2002. In his seventh attempt at the marathon Haile Gebrselassie finally succeeded in breaking the world record writes Pat Butcher. 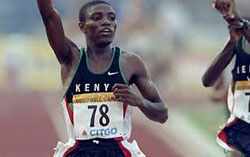 He took 29 seconds off the record of friend and rival, Paul Tergat of Kenya, who ran 2:04:55 in this same event in 2003. "This was something special," said the 34 year old Ethiopian. "The conditions today were perfect". After heavy rain on Saturday, it was 14°C at the start, rising to 18°C at the finish shortly after 11:00. It is the 24th record of Gebrselassie's career. 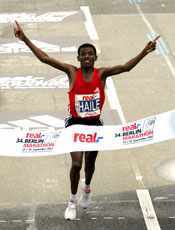 Within 10 minutes of the finish Gebrselassie received a congratulatory call on the race director's telephone from Paul Tergat, whose record he had just broken. 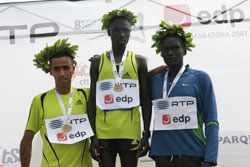 "That's sport, records are made to be broken" said Tergat "I'm happy for him, we are good friends". It was four of Tergat's compatriots — Rodgers Rop, Wilson Kigen, Andrew Limo and Peter Kiprotich, with fellow Ethiopian, Eshetu Wondimu — who paced him as far as 30km. No one else tried to follow, even in the first few kilometres. He was always on target for a sub-2:05 finish, but to break the record he needed to sustain, and even slightly increase the pace. This he did while running alone for the last 12km to establish the sixth world record on Berlin's superfast course. 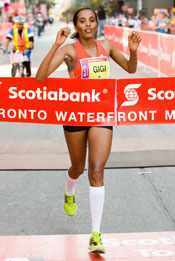 Fellow Ethiopian Gete Wami also successfully defended her title, with a solo run. That was well outside her time of last year, and she admitted that she cruised the last few kilometres, because she plans to run the New York Marathon in just five weeks' time. Irina Mikitenko, in second ran the fastest ever debut by a German woman. 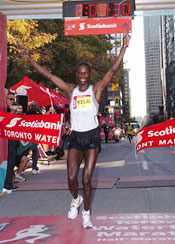 John Kelai won a thrilling duel with defending champion, Daniel Rono to record the fastest time ever run on Canadian soil, eclipsing 1976 Montreal Olympic Champion Waldemar Cierpinski's 2:09:55 set in 1976. In the women's race, Ethiopia's Asha Gigi led from start to finish to set a new course record with last year's winner and former course record-holder, Malgorzata Sobanska, in second. Clear skies, low humidity, little or no wind, and a temperature around 12°C at the 07:00 start presented near-perfect conditions. Pacemakers did a solid job of getting a lead pack of seven to halfway in 65:00 on the flat, scenic course along Lake Ontario. By 30km, passed in 1:32:37, the group was down to five: Kelai and Rono, Ethiopian Kasime Adilo, and other Kenyans, Simon Wangai and Henry Kapkyai. By the turn at the eastern end of the course in The Beaches neighbourhood at 33km, Kapkyai was dropping off. Wangai was the next to go, around 38km, and a very gutsy Kasime Adilo held on until 40km. Rono surged and Kelai went with him, dropping Adilo. Rono went hard again just before 41km and opened up a gap of some 30m. Kelai was looking over his shoulder, and the television commentators "called it" — Rono had made the decisive break. Then, with about 700m to go, Kelai made his move. He was still well back when they made the final turn onto Wellington St, with 600m to go, but closing. The signs clicked by as nail-biting spectators watched on the Finish Line screen… 500m to go, 400m to go, then at 300m to go Kelai blew by Rono for the victory and the new, long-awaited record. The last 5km was covered in well under 15 minutes. Asha Gigi had things all her own way in the Women's race, but did so in dramatic style. Perhaps over-enthused by Haile Gebrselassie's world record run earlier in the day in Berlin, Gigi went through 10km in 33:35, and halfway in 72:13. She faded badly in the later stages but still set a new women's course record. In marked contrast, veteran Malgorzata Sobanska of Poland ran a very even, controlled race, but just ran out of real estate in closing the gap on Gigi. She ran just 11 seconds slower than in 2006, when she set the old course record. In the International Team Challenge for developmental athletes [2 men, 2 women per team], Team Great Britain narrowly defeated Team Mexico. Team Canada was third and Team America/USA was 4th. Over the past 5 years, the sponsorship from Scotiabank and support from adidas have helped lower winning times from 2:17 to 2:14 to 2:11 to 2:10, to yesterday's 2:09:30, and make the event one of the few sub-2:10 races in North America. There were seven individual distances and two relays included in this festival of running which brought 13,600 runners onto the streets of Budapest. 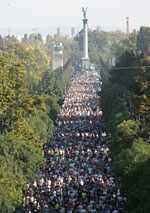 The marathon attracted more than 3000 runners, and almost half of them were foreigners. 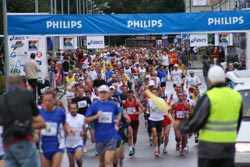 A new distance of 30km event was organised this year in which 500 runners joined the marathoners at the 12,195th metre of the race to finish it together. A decision not to invite elite foreign runners meant that the winners were Hungarians, and repeated their victories of the previous year. The course passes the most scenic parts of the Hungarian capital and 35 music stations along the course cheered the runners and helped them to achieve their target times. The eldest Hungarian runner was 80 years old and ran a new Hungarian record in his category, finishing in 4:40. Overall 1600 foreign runners came to Budapest from 40 different countries; the most runners came from France and Finland, followed by runners from the UK, German, Italy and the USA.